Drug interactions elicited through inhibition of cytochrome P450 (P450) enzymes are important in pharmacotherapy. Recently, greater attention has been focused on not only parent drugs inhibiting P450 enzymes but also on possible inhibition of these enzymes by circulating metabolites. In this report, an ex vivo method whereby the potential for circulating metabolites to be inhibitors of P450 enzymes is described. To test this method, seven drugs and their known plasma metabolites were added to control human plasma at concentrations previously reported to occur in humans after administration of the parent drug. A volume of plasma for each drug based on the known inhibitory potency and time-averaged concentration of the parent drug was extracted and fractionated by high-pressure liquid chromatography–mass spectrometry, and the fractions were tested for inhibition of six human P450 enzyme activities (CYP1A2, CYP2C8, CYP2C9, CYP2C19, CYP2D6, and CYP3A4). Observation of inhibition in fractions that correspond to the retention times of metabolites indicates that the metabolite has the potential to contribute to P450 inhibition in vivo. Using this approach, norfluoxetine, hydroxyitraconazole, desmethyldiltiazem, desacetyldiltiazem, desethylamiodarone, hydroxybupropion, erythro-dihydrobupropion, and threo-dihydrobupropion were identified as circulating metabolites that inhibit P450 activities at a similar or greater extent as the parent drug. A decision tree is presented outlining how this method can be used to determine when a deeper investigation of the P450 inhibition properties of a drug metabolite is warranted. Drug–drug interactions (DDIs) that arise via inhibition of cytochrome P450 (P450) enzymes are important in pharmacotherapy. Through extensive research over the past 3 decades, the science underlying this mechanism of DDIs is well understood (Rodrigues, 2008). The extent of our understanding of P450-based DDIs is so great that current practices of relating in vitro enzyme inhibition data to in vivo DDI outcomes now leverage sophisticated physiologically based pharmacokinetic (PBPK) modeling approaches that can test DDI hypotheses using different subsets of subject populations (Varma et al., 2015; Wagner et al. 2015). Nevertheless, despite this depth of understanding, specific examples exist that demonstrate that there can be DDIs that are not necessarily expected. One such possibility is when a metabolite of a drug, not the drug itself, is the entity responsible for inhibition of a P450 enzyme. For example, gemfibrozil glucuronide is shown to be responsible for serious DDIs with cerivastatin via inhibition of CYP2C8, whereas the parent drug gemfibrozil does not inhibit that enzyme (Shitara et al., 2004; Ogilvie et al., 2006). Bupropion metabolites are putatively responsible for inhibition of CYP2D6-mediated clearance of desipramine, whereas the parent drug is not (Reese et al., 2008). In other cases, a metabolite can add to the inhibition of a P450 enzyme already inhibited by the parent drug. Itraconazole inhibits CYP3A and causes DDIs, and metabolites of itraconazole can add to this inhibition (Ke et al., 2014). Although examples of drug metabolites being responsible for DDIs are rare (Yeung et al., 2011; Callegari et al., 2013; Yu and Tweedie, 2013), they nevertheless can be important, such that government pharmaceutical regulatory authorities now recommend that metabolites having exposure at 25% of that of parent and/or representing 10% of total drug-related material in the human circulation be tested for their potential to inhibit drug-metabolizing enzymes (http://www.fda.gov/downloads/drugs/guidancecomplianceregulatoryinformation/guidances/ucm292362.pdf, http://www.ema.europa.eu/docs/en_GB/document_library/Scientific_guideline/2012/07/WC500129606.pdf, http://www.solvobiotech.com/documents/Japanese_DDI_guideline_(draft)_2014Jan.pdf). In the development of new drugs, it is common practice to test these compounds for their potential to inhibit P450 enzymes before administration to humans for the first time. However, it is not common to test drug metabolites for this property at that time, because of the fact that the circulating metabolites in humans would not yet be known. In vitro drug metabolism experiments using human-derived reagents (liver microsomes, hepatocytes, etc.) can yield dozens of metabolites, but it is challenging to predict those that would be present in the circulation at specific concentrations (Lutz and Isoherranen, 2012; Loi et al., 2013; Nguyen et al., 2016). When human subjects are dosed with a new drug candidate for the first time, modern bioanalytical approaches, such as high-resolution mass spectrometry (MS), can offer considerable qualitative insight into the identities of important circulating metabolites. From that information, possible metabolite structures can be synthesized and verified. With authentic standards of metabolites in hand, each can be tested for its potential to inhibit P450 enzymes, its plasma concentrations can be measured, and the data can be used in the aforementioned PBPK models to predict DDIs. However, this is a lengthy and convoluted process; in the majority of cases, the likely outcome will be that the metabolite(s) will not have any effect (Callegari et al., 2013; Yu and Tweedie, 2013). To this end, we have developed a method whereby human plasma samples from subjects dosed with the drug candidate can be used to test for inhibition of P450, thereby obviating the need for identification, synthesis, testing, and measurement of plasma concentrations of metabolites. This approach (termed “activity-grams”) was previously used to find pharmacologically active metabolites (Obach, 2013; Sawant-Basak et al., 2013; Walker et al., 2014). It has now been applied for P450 inhibition using control human plasma to which relevant concentrations of drug and metabolite(s) for seven drugs were added. The method and results are described herein. Heterologously expressed recombinant DNA–derived human CYP1A2, CYP2C9, CYP2D6, and CYP3A4 enzymes coexpressed with P450 oxidoreductase were obtained from Panvera Corporation (Madison, WI). CYP2C8 and CYP2C19 coexpressed with both oxidoreductase and cytochrome b5 were from BD Gentest (Woburn, MA). Hydroxyitraconazole, norfluoxetine, erythro-hydrobupropion, threo-hydrobupropion, desmethylcitalopram, didesmethylcitalopram, desacetyldiltiazem, and desmethyldiltiazem were from Toronto Research Chemicals (Toronto, ON, Canada). NADPH, itraconazole, fluoxetine, citalopram, diltiazem, bupropion, gemfibrozil, amiodarone, tacrine, amodiaquine, diclofenac, dextromethorphan, and dextrorphan were from Sigma-Aldrich (St. Louis, MO). (S)-Mephenytoin was from Biomol (Plymouth Meeting, PA). Bupropion, 4-hydroxybupropion, and (S)-4′-hydroxymephenytoin were from Syncom (Groningen, Netherlands). 1-Hydroxytacrine, desethylamodiaquine, midazolam, [2H3]1-hydroxytacrine, [2H5]N-desethylamodiaquine, [2H3]dextrorphan, and [2H4]1′-hydroxymidazolam were prepared under contract by Cerilliant Corp. (Austin, TX). [2H3](S)-4′-hydroxymephenytoin, [13C6]4′-hydroxydiclofenac, 4′-hydroxydiclofenac, and 1′-hydroxymidazolam were prepared at Pfizer (Groton, CT). Gemfibrozil acyl glucuronide was custom synthesized at Wuxi App Tec (Shanghai, China). Control human plasma (Bioreclamation IVT, Baltimore, MD) was spiked from 5-mM stock solutions of drugs and metabolites in acetonitrile or water to final concentrations representative of time-averaged concentrations (Cavg) in humans at normal therapeutic dose levels. These are listed in Table 1. (1)in which the IC50 and Cavg for the parent drug are in micromolar units (nanomoles per milliliter) and the assay volume is 0.1 ml. The extraction volume was calculated this way to target the presence of enough of the parent drug in the inhibition assay to yield approximately 90% inhibition of the most potently inhibited P450 enzyme (i.e., factor of 10 in the equation), assuming incomplete extraction efficiency and elution of the parent into two high-pressure liquid chromatography (HPLC) fractions (i.e., factor of 4 in the equation). The mixture was mixed vigorously and then spun in a centrifuge (Jouan, St. Herblen, France) at 1700g for 5 minutes, and the supernatant was transferred to a vacuum centrifuge (Genevac EZ-2; SP Scientific, Valley Cottage, NY). The supernatant was evaporated under the HPLC solvent setting at 40°C or less. Formic acid (1%) in water containing CH3CN (10%) was added to the dried residues. The sample was injected onto an HPLC-MS system, which comprised a Thermo-Finnigan LTQ ion trap mass spectrometer equipped with a Surveyor quaternary HPLC pump, degasser, autoinjector, and diode array UV-visible detector (Thermo-Fisher Scientific, Waltham, MA). Separation was effected on a Polaris C18 column (4.6 × 250 mm, 5-µm particle size; Agilent Technologies, Santa Clara, CA) using a mobile phase of 0.1% formic acid in water and CH3CN. The flow rate was set at 0.8 ml/min and the mobile-phase gradient was programmed to optimize the separation of the parent drug from its respective metabolites in a 40-minute run time. The UV-visible detector monitored absorbance of wavelengths from 200 to 400 nm. The flow emanating from the UV-visible detector was split at a ratio of approximately 15:1, with the smaller portion introduced into the mass spectrometer and the majority going to a fraction collector (CTC-PAL; Leap Technologies, Carrboro, NC). The mass spectrometer was operated in the positive mode. Source potentials and settings were adjusted to optimize the signal for the parent drug. MS1, MS2, and MS3 data were collected, with the latter in data-dependent scanning mode of the two most abundant ions detected. In the case of gemfibrozil, the mass spectrometer was operated in the negative ion mode, and a postcolumn, postsplit infusion of ammonium hydroxide (30% at 1 µl/min) was connected to the eluent entering the mass spectrometer. Fractions were collected into 96-well polypropylene 1.2-ml cluster tubes at 30-second intervals. Collection commenced at 6 minutes postinjection to avoid bulk materials eluting in the void volume until 40 minutes postinjection. The fractions were transferred to the Genevac vacuum centrifuge and the solvent was removed by evaporation. For itraconazole and gemfibrozil, fractions were collected into a 96-well block containing glass inserts that had been subjected to gas-phase silylation to reduce the potential for nonspecific adsorption. For each plasma sample processed that contained a drug and metabolite(s) mixture, a corresponding control plasma sample was processed in parallel. An alternate solid-phase extraction method was used for drugs requiring a larger volume of plasma to extract (based on the calculation made in eq. 1). Waters Oasis cartridges (HLB, 6 g, 35 ml, 60-µm particle size; Waters, Milford, MA) were preconditioned using 40 ml methanol, followed by 40 ml 1% formic acid in water. Formic acid was added to plasma samples (up to 20-ml volume) to a final concentration of 1%, and these were applied to the solid-phase extraction cartridge. The cartridge was washed with 10% CH3CN in 1% aqueous formic acid (40 ml) followed by elution with 80% CH3CN in 1% aqueous formic acid (40 ml). The eluent was evaporated in a vacuum centrifuge as above, and all further processing and fractionation was done as in method 1. A mixture (0.05 mL) containing buffer, MgCl2, NADPH, and substrates was added to tubes containing dried fractions. These were subjected to sonication for 10 minutes and then prewarmed in a 96-well heating block at 37°C for 5 minutes. A mixture of six recombinant P450 enzymes in 0.05 ml was added to these tubes. Final incubation concentrations were as follows: CYP1A2 (6.6 pmol/ml), CYP2C8 (0.67 pmol/ml), CYP2C9 (3.7 pmol/ml), CYP2C19 (55 pmol/ml), CYP2D6 (1.0 pmol/ml), CYP3A4 (2.2 pmol/ml), tacrine (3.0 µM), amodiaquine (1.0 µM), diclofenac (3.0 µM), S-mephenytoin (20 µM), dextromethorphan (0.5 µM), midazolam (1.0 µM), potassium phosphate (0.1 M, pH 7.45), MgCl2 (3.3 mM), and NADPH (1.3 mM). Incubations were carried out for 8 minutes and terminated by the addition of 0.3 ml internal standard mixture in formic acid/CH3CN (0.1:99.9). Internal standards in the termination solution were at the following concentrations: [2H3]1-hydroxytacrine (5 nM), [2H5]N-desethylamodiaquine (5 nM), [13C6]4′-hydroxydiclofenac (20 nM), [2H3](S)-4′-hydroxymephenytoin (50 nM), [2H3]dextrorphan (5 nM), and [2H4]1′-hydroxymidazolam (20 nM). Samples were centrifuged at 2300g for 5 minutes. Three-hundred microliters of supernatant was dried using a nitrogen gas evaporator, followed by reconstitution in 150 µl formic acid/CH3CN/water (0.1:10:89.9). The HPLC-MS system consisted of an AB Sciex (Framingham, MA) triple quadrupole mass spectrometer with a TurboIonSpray source and a Waters Acquity autosampler and UPLC system. Analytes were separated using a Halo C18 column (2.0 µm, 2.1 × 5 mm, MacMod, Chaddsford, PA). Mobile phase A was 0.1% formic acid in water and mobile phase B was 0.1% formic acid in acetonitrile. The following program describes %B in the mobile phase: hold at 10% 0 to 0.1 minutes, ramp to 70% from 0.1 to 2.0 minutes, ramp to 95% from 2.0 to 2.1 minutes and hold at 95% through 2.35 minutes, and step to 10% at 2.4 minutes and hold for column equilibration. The sample injection volume was 10 µl and the flow rate was 0.5 ml/min. The mass spectrometer was operated in multiple reaction mode with scheduled multiple reaction monitoring (40-second detection window). Samples were monitored for metabolites and internal standards; mass-to-charge ratio transitions and retention times were as follows: desethylamodiaquine (328.2 → 282.9, 0.56 minutes), [2H5]N-desethylamodiaquine (333.2 → 283.0, 0.56 minutes), 1-hydroxytacrine (215.1 → 197.1, 0.55 minutes), [2H3]1-hydroxytacrine (218.1 → 200.2, 0.55 minutes), dextrorphan (258.1 → 201.1, 0.81 minutes), [2H3]dextrorphan (261.1 → 201.1, 0.81 minutes), (S)-4′-hydroxymephenytoin (235.2 → 150.1, 0.95 minutes), [2H3](S)-4′-hydroxymephenytoin (239.1 → 151.0, 0.95 minutes), 1′-hydroxymidazolam (342.1 → 323.9, 1.09 minutes), [2H4]1′-hydroxymidazolam (346.1 → 328.0, 1.09 minutes), 4′-hydroxydiclofenac (311.8 → 266.1, 1.67 minutes), and [13C6]4′-hydroxydiclofenac (318.0 → 272.0, 1.67 minutes). Data were analyzed using Analyst 1.6 or MultiQuant 3.0 software (AB Sciex). Standards of each probe metabolite were fit by least-squares regression with 1/x2 weighting and unknown concentrations were determined from the resulting best-fit equation. Standard concentrations were selected to ensure that metabolite formation was within the linear dynamic range of the instrument. Percent inhibition versus control wells was calculated in Microsoft Excel (Redmond, WA). The evaporated fractions from HPLC occupied 68 tubes. Four tubes were used as the controls (no fraction) and 16 tubes were used to construct the standard curves. Four tubes were used as positive controls, wherein the parent drug for each run was added in 0.1% formic acid in 50% CH3CN at a concentration such that there would be expected to be 75% inhibition of the most potently inhibited enzyme. These tubes were subjected to evaporation with the HPLC fractions. This serves as a check that the reconstitution process adequately redissolved the drug. The seven parent drugs used to develop this approach were first tested for their abilities to inhibit the six P450 enzyme activities. IC50 values are listed in Table 2 and are consistent with values previously described in the scientific literature. P450 inhibition activity-grams are shown in Figs. 1–7. Among the drugs tested, four general outcomes were observed: 1) a metabolite(s) contributes a greater inhibition than the parent drug for one or more enzymes (bupropion metabolites, desacetyldiltiazem), 2) metabolites have relevant/similar contributions as the parent drug (fluoxetine, itraconazole, diltiazem, amiodarone), 3) the parent and metabolites essentially lack DDIs (citalopram), and 4) a result was inconclusive because of technical problems (gemfibrozil). HPLC-MS traces and P450 inhibition activity-grams for bupropion and metabolites in human plasma. The top panel is an HPLC-MS chromatogram for extracted control human plasma. The second panel from the top is an HPLC-MS chromatogram for extracted human plasma containing bupropion and metabolites. The remaining panels are activity-grams for P450 inhibition by HPLC fractions of the control (red) and dosed (blue) plasma extracts for CYP2C19, CYP2D6, and CYP3A4. 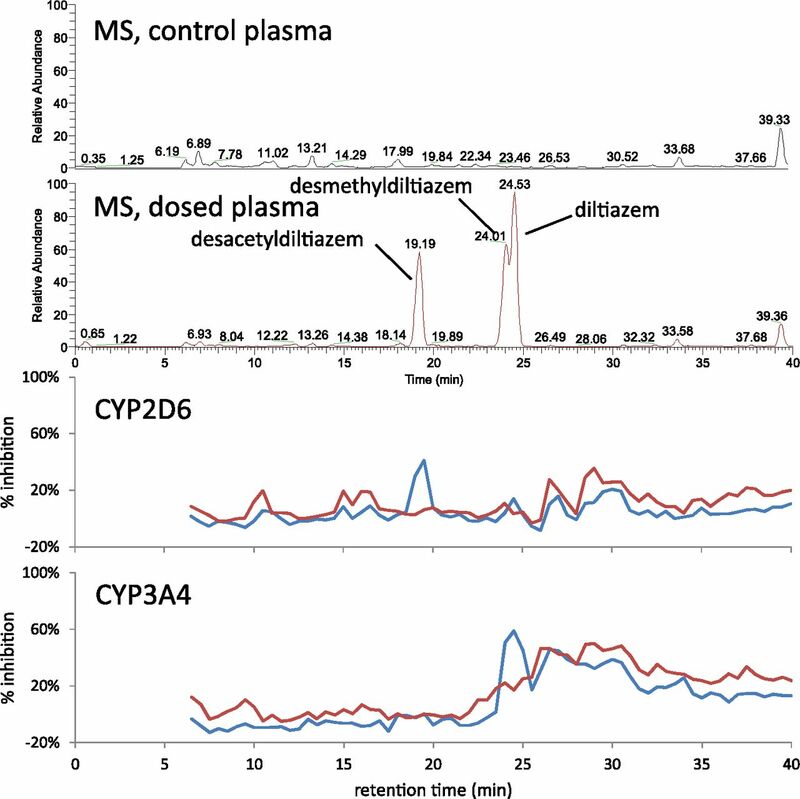 HPLC-MS traces and P450 inhibition activity-grams for diltiazem and metabolites in human plasma. The top panel is an HPLC-MS chromatogram for extracted control human plasma. The second panel from the top is an HPLC-MS chromatogram for extracted human plasma containing diltiazem and metabolites. The remaining panels are activity-grams for P450 inhibition by HPLC fractions of the control (red) and dosed (blue) plasma extracts for CYP2D6 and CYP3A4. HPLC-MS traces and P450 inhibition activity-grams for fluoxetine and norfluoxetine in human plasma. The top panel is an HPLC-MS chromatogram for extracted control human plasma. The second panel from the top is an HPLC-MS chromatogram for extracted human plasma containing fluoxetine and norfluoxetine. The remaining panels are activity-grams for P450 inhibition by HPLC fractions of the control (red) and dosed (blue) plasma extracts. 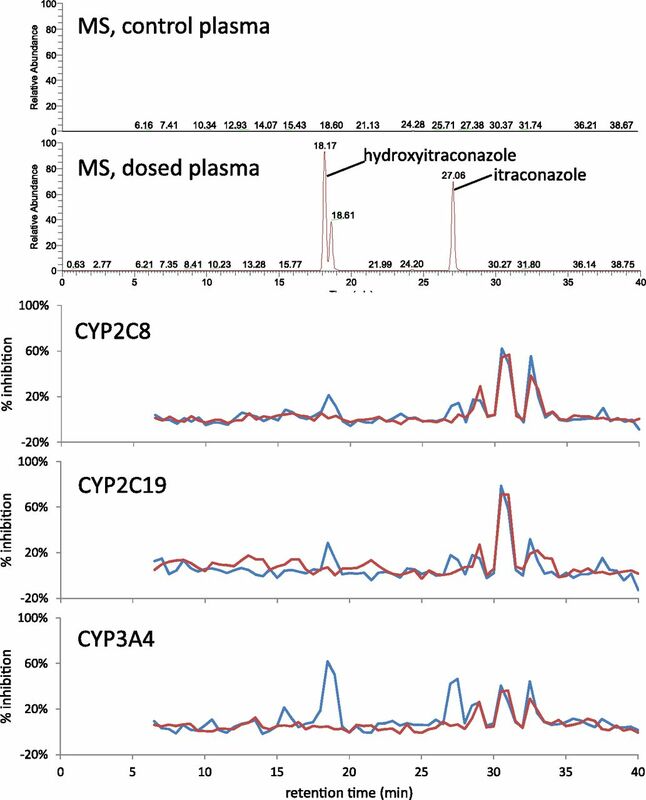 HPLC-MS traces and P450 inhibition activity-grams for itraconazole and hydroxyitraconazole in human plasma. The top panel is an HPLC-MS chromatogram for extracted control human plasma. The second panel from the top is an HPLC-MS chromatogram for extracted human plasma containing itraconazole and hydroxyitraconazole. 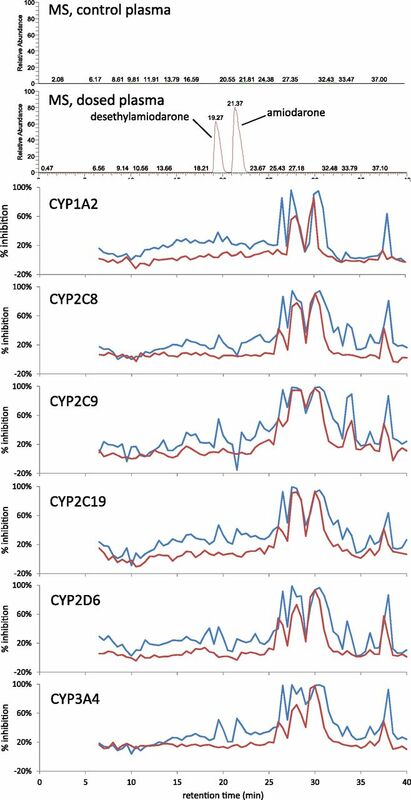 The remaining panels are activity-grams for inhibition of CYP2C8, CYP2C19, and CYP3A4 by HPLC fractions of the control (red) and dosed (blue) plasma extracts. Note that the hydroxyitraconazole sample obtained from the vendor had an isomeric impurity eluting at 18.6 minutes. HPLC-MS traces and P450 inhibition activity-grams for amiodarone and desethylamiodarone in human plasma. The top panel is an HPLC-MS chromatogram for extracted control human plasma. The second panel from the top is an HPLC-MS chromatogram for extracted human plasma containing amiodarone and desethylamiodarone. The remaining panels are activity-grams for P450 inhibition by HPLC fractions of the control (red) and dosed (blue) plasma extracts. HPLC-MS traces and P450 inhibition activity-grams for citalopram and metabolites in human plasma. The top panel is an HPLC-MS chromatogram for extracted control human plasma. The second panel from the top is an HPLC-MS chromatogram for extracted human plasma containing citalopram and metabolites. The remaining panels are activity-grams for P450 inhibition by HPLC fractions of the control (red) and dosed (blue) plasma extracts. HPLC-MS traces and P450 inhibition activity-grams for gemfibrozil and its acyl glucuronide metabolite in human plasma. The top panel is an HPLC-MS chromatogram for extracted control human plasma. The second panel from the top is an HPLC-MS chromatogram for extracted human plasma containing gemfibrozil and gemfibrozil glucuronide. The remaining panels are activity-grams for CYP2C8 and CYP2C19 inhibition by HPLC fractions of the control (red) and dosed (blue) plasma extracts. Note that the MS response signal for gemfibrozil was far lower than that for the glucuronide in the conditions used. Bupropion is metabolized by hydroxylation as well as reduction of the ketone moiety to isomeric alcohol metabolites. The metabolites circulate at greater concentrations than the parent drug (Table 1), with hydroxybupropion at more than 30-fold the parent. On the basis of the concentration and inhibitory potency of bupropion, a maximum 20-ml plasma sample containing the parent drug and metabolites at clinically relevant concentrations was processed by method 2 and fractionated by HPLC. Hydroxybupropion eluted in a large broad peak at 19.3 minutes, with bupropion and the two reduced metabolites eluting afterward at 23.0, 23.9, and 24.8 minutes (Fig. 1). Activity-grams for CYP2C19, CYP2D6, and CYP3A4 inhibition are shown in Fig. 1. (No effects were observed for the other enzymes.) In the activity-grams, the inhibition caused by HPLC fractions of the plasma extracts are plotted for both the control and dosed plasma; thus, the control can be used to establish the background noise of the assay as well as any endogenous plasma materials that could be inhibitory (see other examples below). 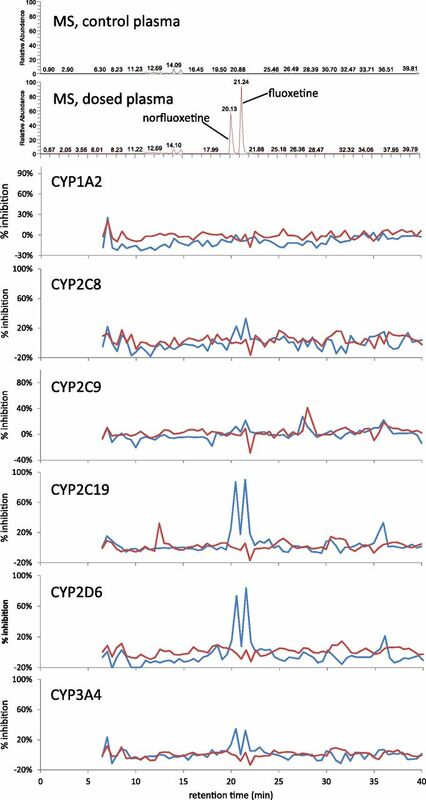 Marked inhibition was observed corresponding to the metabolite peaks for CYP2C19 and CYP2D6. Bupropion coadministration with CYP2D6 cleared drugs was previously shown to have an important effect and this has been proposed to occur via the metabolites (Kotlyar et al., 2005; Reese et al., 2008). The activity-gram approach with human plasma corroborates this. In addition, the data suggest that bupropion administration could cause DDIs for drugs cleared by CYP2C19 via its metabolites. A small peak of inhibition was also observed in the CYP3A4 activity-gram corresponding to hydroxybupropion. Although the intrinsic inhibitory potency of bupropion metabolites may not be greater than bupropion itself, the inhibition would be expected to be elicited via their higher concentrations in vivo. Diltiazem and desmethyldiltiazem are known to be CYP3A mechanism-based inactivators and diltiazem coadministration with CYP3A-cleared drugs results in DDIs. A human plasma sample (20 ml) containing diltiazem, desmethyldiltiazem, and desacetyldiltiazem at clinically relevant plasma concentrations (Table 1) was subjected to the processing described in method 2. 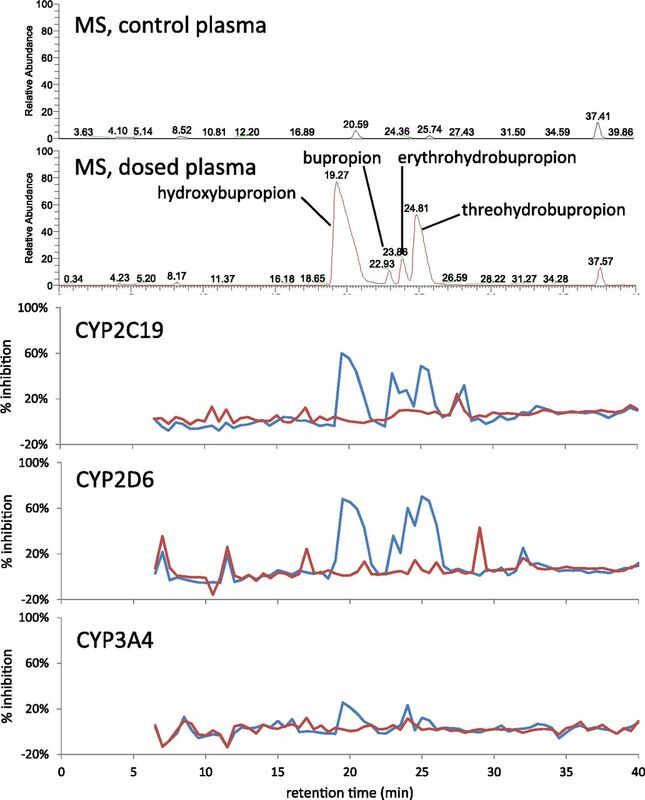 HPLC-MS chromatograms and activity-grams for CYP2D6 and CYP3A4 inhibition are shown in Fig. 2. Diltiazem and its desmethyl metabolite could not be baseline resolved by HPLC, and inhibition of CYP3A4 shown in the activity-gram at 24 to 25 minutes could be ascribed to one or both. In addition, although the P450 activity assay was designed as a test for reversible inhibition, it was capable of detecting the CYP3A4 inhibition via a mechanism-based inactivator. Desacetyldiltiazem, eluting at 19.1 minutes, was shown to inhibit CYP2D6, whereas neither diltiazem nor desmethyldiltiazem showed an effect on this enzyme. This offers an example of a metabolite possessing P450 inhibition activity although the parent drug does not. Desacetyldiltiazem was previously reported to inhibit CYP2D6 and a small DDI has been reported for diltiazem and metoprolol, a CYP2D6 substrate (Tateishi et al., 1989; Molden et al., 2002). No inhibition peaks were observed in activity-grams for the other enzymes (data not shown). Fluoxetine is known to inhibit CYP2D6 and CYP2C19 (Sager et al., 2014). The major metabolite of fluoxetine is norfluoxetine, which circulates at a concentration slightly greater than fluoxetine and has a longer half-life. A 2.5-ml sample of plasma containing 1.1 and 1.3 µM fluoxetine and norfluoxetine, respectively, was subjected to extraction using method 1. The activity-grams for effects on all six enzymes are shown in Fig. 3, along with the ion chromatogram showing the elution of norfluoxetine and fluoxetine at 20.1 and 21.2 minutes, respectively. CYP2D6 and CYP2C19 showed inhibition peaks coincident with the retention times of both the parent and metabolite. In each case, the magnitudes of the two peaks are similar, suggesting that the metabolite would likely contribute to drug interactions as much as the parent drug for substrates of these two enzymes. Inhibition was detectable for CYP3A4 and CYP2C8, albeit it was much lower than that for CYP2D6 and CYP2C19. Inhibition was not observed for CYP1A2 or CYP2C9. Activity-grams for plasma extracts (0.44 ml processed using method 1) containing itraconazole and hydroxyitraconazole are shown in Fig. 4. 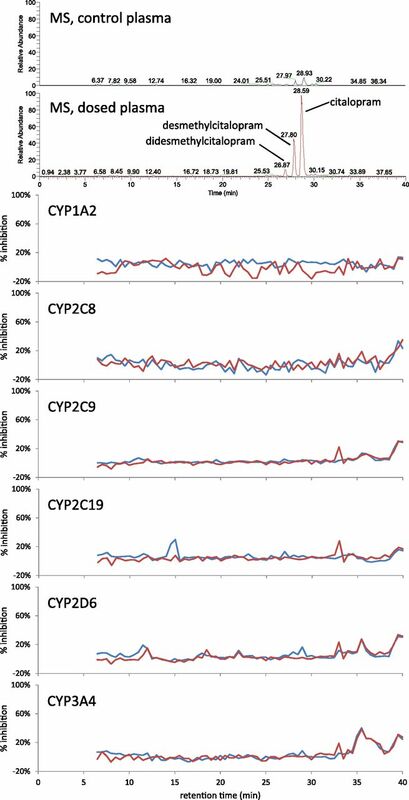 No inhibition was observed for CYP1A2, CYP2C9, or CYP2D6 (not shown) but peaks of inhibition were observed for CYP2C8, CYP2C19, and CYP3A4. Preliminary studies showed low inhibition owing to poor reconstitution of the dried fractions, consistent with the physicochemical properties of itraconazole. This necessitated the use of silylated glass tubes for fraction collection, evaporation, reconstitution, and enzyme assays. As expected, peaks of inhibition were observed for both hydroxyitraconazole and itraconazole for CYP3A4 at 18.1- and 27.1-minute retention times. Previously reported PBPK modeling of the itraconazole–CYP3A DDI has shown that the metabolite contributes to the effect (Vossen et al., 2007; Ke et al., 2014) and this is reinforced by the activity-gram data, which show inhibition peaks for both hydroxyitraconazole and itraconazole. The mobile-phase composition used to elute itraconazole had a greater acetonitrile percentage than for other examples. This resulted in the observation of endogenous materials eluting at 29–34 minutes that inhibited the P450 activities and emphasizes the importance of comparing control and dosed plasma side by side. Amiodarone is a highly lipophilic drug that undergoes N-deethylation. Human plasma (18 ml) spiked with amiodarone and desethylamiodarone at 3.5 and 2.1 µM, respectively, was extracted using method 2 and the extract fractionated by HPLC (Fig. 5). As with itraconazole, a high percentage of organic modifier was necessary to elute the drug and metabolite; however, because there was a greater volume extracted than for itraconazole (see above), there was an even greater degree of interference in the activity-gram at later retention times for all six enzymes. Inhibition peaks were observable in the CYP3A4 activity-gram; however, these could not be reliably discerned in other enzymes, albeit there may be some small peaks for desethylamiodarone for some of the other enzymes. The example of amiodarone represents a limitation of this approach regarding the lipophilicity of the drug that can be examined. Citalopram is known to not cause DDIs via inhibition of P450 enzymes and, with its two circulating N-demethylated metabolites, it was used as a negative control for the approach. The maximum volume of plasma (20 ml) containing citalopram, desmethylcitalopram, and didesmethylcitalopram at clinically relevant concentrations was extracted using method 2 and fractionated by HPLC. Retention times for citalopram and its two metabolites were 28.6, 27.8, and 26.9 minutes, respectively. No effect on any of the six P450 enzyme activities tested was observed in fractions eluting in this retention time region (Fig. 6). Gemfibrozil and its glucuronide metabolite posed the greatest challenge to the method. The resulting P450 inhibition activity-grams contained several interfering peaks of inhibition (Fig. 7) and made most of the data uninterpretable. A small peak of inhibition can be discerned in the CYP2C8 activity-gram corresponding to the elution of gemfibrozil glucuronide; however, this signal is not reliable enough to identify the metabolite as an inhibitor. In addition, the activity-gram had endogenous interferences in the extract eluting near gemfibrozil, preventing detection of a signal of inhibition and rendering the result as inconclusive (see Fig. 8 and below). This example illustrates the value of the parent compound serving as its own positive control, in that the absence of observation of inhibition of CYP2C19 by gemfibrozil successfully identified that the approach was not useable in this case. Investigation of the failure could not conclusively demonstrate a reason; however, it was shown that gemfibrozil and the glucuronide were successfully extracted, fractionated, and reconstituted, but that concentrations after incubation were lower than expected. 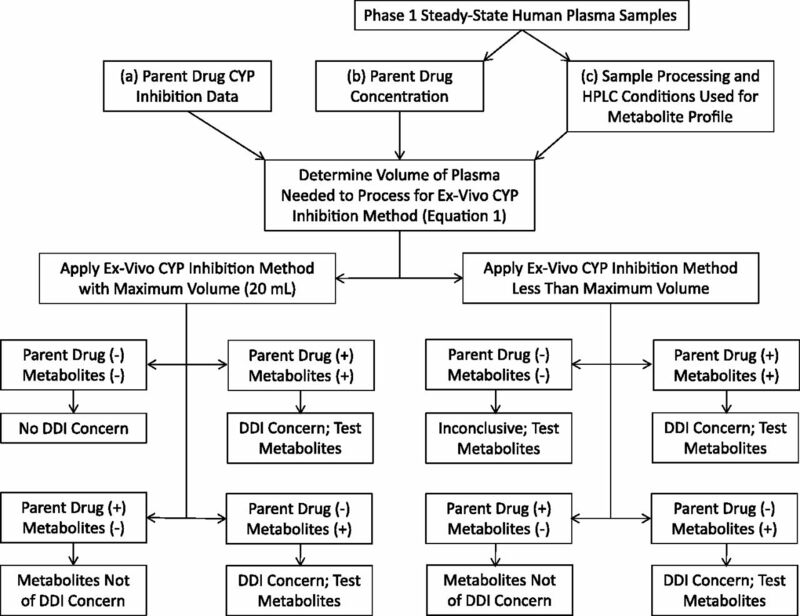 Decision tree scheme for application of an ex vivo method for evaluating the potential for circulating metabolites as P450 inhibitors. CYP, cytochrome P450. The method described in this report offers a viable shortcut approach to evaluating whether circulating drug metabolites could have a meaningful contribution to DDIs, without the need for obtaining authentic standards of metabolites and testing each of them individually. A suggested logic tree for insertion of this method into the drug development process is shown in Fig. 8. It is dependent on three pieces of information that would ordinarily be known at the time that human plasma samples from subjects dosed with a new drug candidate are available, such that the method could be employed: 1) in vitro potency of the parent drug against P450 enzyme activities, 2) the concentration of the parent drug in plasma, and 3) HPLC-MS conditions that would have been developed and used to qualitatively characterize the metabolite profile in human plasma samples. With this knowledge in hand, a volume of plasma from dosed human subjects can be selected for extraction and fractionation, and the fractions can be tested for P450 inhibition using the method described in this report. If peaks of inhibition are observed that are not eluting where the parent drug elutes, this suggests that there is a plasma metabolite that inhibits a P450 activity. Since the abundance of the metabolite is not known, the inhibition could be attributable to a minor metabolite that is very potent or a very abundant metabolite that is less potent. Irrespective of low abundance/high potency or high abundance/low potency, the data would suggest that there could be inhibition in vivo. Positive findings from the ex vivo activity-gram would lead to a deeper investigation of the metabolite, delineating it as one worthy of the investment to synthesize and test it. However, if there are no other peaks of inhibition in the activity-gram except for the parent drug, then the approach has shown that no further work on metabolites as inhibitors of P450 enzymes is needed. On the basis of an analysis of known drugs (Yeung et al., 2011; Callegari et al., 2013; Yu and Tweedie, 2013), it can be anticipated that this latter result will be the more frequent outcome and this method can thus be employed as a quick and resource-sparing approach to reliably obtain this outcome. A volume of 20 ml is the maximum that can feasibly be evaluated using this approach. For parent drugs that do not inhibit P450 enzymes (or are weak), this maximum volume can be used; thus, if there are no inhibition peaks, then it is likely that DDIs will not be of concern (as illustrated by the citalopram data). For lipophilic drugs, the HPLC mobile-phase composition needed for elution is such that endogenous plasma materials will also elute that can show P450 inhibition. This was observed in the examples of itraconazole, gemfibrozil, and amiodarone and was very pronounced in the latter case because a high volume of plasma needed to be processed. (As an aside, initial attempts were made to merely test whole plasma extracts containing the parent drug versus those containing the parent drug plus metabolite for P450 inhibition, as a means to identify the potential for metabolites to contribute to inhibition. These attempts failed because even plasma that did not contain the drug or metabolites showed considerable inhibition. This necessitated the use of HPLC to resolve the drug and metabolites from these endogenous materials. The identities of these plasma endogenous materials are unknown.) Thus, this method is likely not applicable in an example like amiodarone because of this observation, as well as the greater challenge of ensuring that lipophilic drugs and metabolites are suitably redissolved from the dried fractions when they are reconstituted in P450 assay buffer. In an example such as amiodarone, the more conventional approach of synthesizing and testing individual metabolites would be warranted, or alternate sample work-up procedures and chromatographic methods may be needed. In the case of itraconazole, the hydroxy metabolite was readily identifiable as a contributor to CYP3A4 inhibition and would have triggered a closer examination of this metabolite. Like the example of itraconazole/hydroxyitraconazole, the example of fluoxetine/norfluoxetine also illustrates that a metabolite can contribute, with the parent drug, to a DDI. This would be particularly salient if, using PBPK modeling, the parent drug alone is not projected to cause a DDI, but the combination of the parent and metabolite would be enough to predict a DDI. In the examples of bupropion and diltiazem, the method showed that metabolites of these drugs can be responsible for DDIs. Hydroxybupropion is present in a much higher concentration in plasma than bupropion and thus inhibition of CYP2D6 is attributable to this metabolite. The findings also show that CYP2C19 may be of concern for bupropion and its metabolites. Diltiazem and desmethyldiltiazem were shown to be CYP3A4 inhibitors using the approach, as expected (albeit baseline chromatographic resolution was not attainable for these two compounds). Importantly, desacetyldiltiazem was identified as a CYP2D6 inhibitor using this approach, which was reported previously (Molden et al., 2002). If this approach were used prospectively, it would have directed a closer examination of desacetyldiltiazem as a possible CYP2D6 inhibitor. The examples of amiodarone and gemfibrozil show the limits of the method, whereas the other examples offer a clear picture of the inhibition potential of metabolites. It will thus be important to carefully evaluate the robustness of the data with regard to interferences from endogenous plasma components when using this approach in a truly prospective manner. 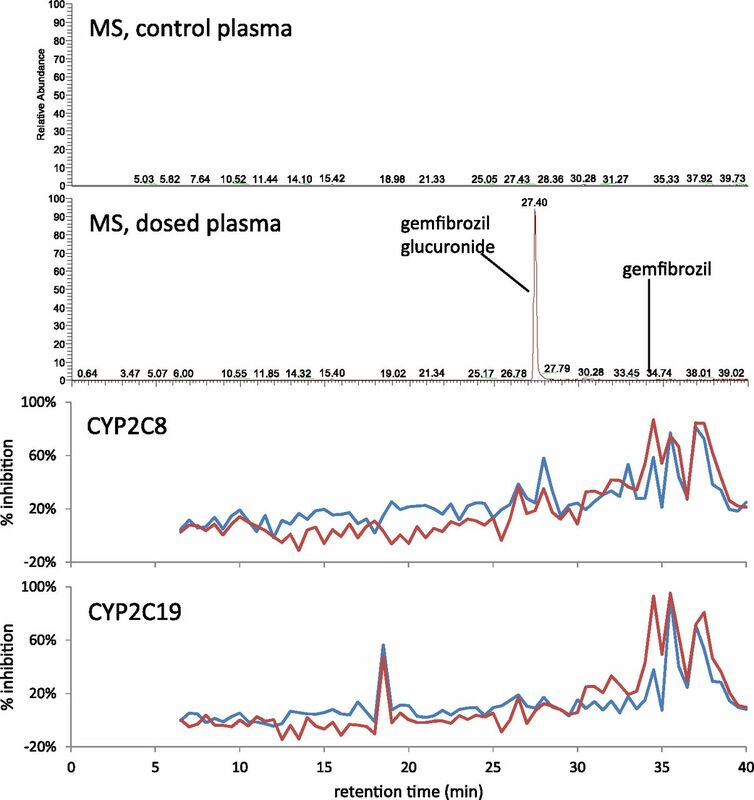 Gemfibrozil glucuronide, a mechanism-based inactivator of CYP2C8, was not identified using the method; however, there was also no inhibition of CYP2C19 where gemfibrozil itself eluted, indicating an inconclusive study (Fig. 8). In such a case, investigation of the potential for circulating metabolites to inhibit P450 enzymes would need to be done directly using a synthesized standard(s) of the metabolite(s). In summary, a method is described whereby the potential for circulating drug metabolites to inhibit important P450 enzymes can be assessed. Knowledge of the identities and plasma concentrations of individual metabolites is not required, nor does an authentic standard need to be made. (In some cases, chemical synthesis of drug metabolites can be extremely challenging.) Since actual plasma samples from humans dosed with the parent drug are used as the source material, the findings should be meaningful for understanding whether a DDI concern is truly warranted, since metabolites would be present at pertinent concentrations relative to the parent drug. Observation of an inhibition peak in an activity-gram where a metabolite elutes would lead to a more standard investigation of the metabolite as an inhibitor (i.e., synthesis, measurement of plasma protein binding, determination of inhibition potency and mechanism, and use of PBPK modeling to project in vivo DDIs). An observation of no new inhibition peaks (besides the parent drug) would obviate any further investigation. It is important to note that the method is limited to metabolites in the circulation and it is possible that a metabolite could be formed in the liver and cause P450 inhibition without that metabolite entering the circulation. Nevertheless, this method should be applicable to meet recently added regulatory requirements that not only parent drugs require evaluation for their potential to inhibit drug metabolizing enzymes, but that circulating metabolites must be evaluated as well. The potential for application of this approach to other DDI endpoints merits further investigation. The authors thank Drs. Larry Tremaine and Li Di for support of this endeavor. Participated in research design: Eng, Obach. Performed data analysis: Eng, Obach. Wrote or contributed to the writing of the manuscript: Eng, Obach. (1993) Food interaction and steady-state pharmacokinetics of itraconazole capsules in healthy male volunteers. Antimicrob Agents Chemother 37:778–784. (2013) Drug metabolites as cytochrome p450 inhibitors: a retrospective analysis and proposed algorithm for evaluation of the pharmacokinetic interaction potential of metabolites in drug discovery and development. Drug Metab Dispos 41:2047–2055. (1988) Bupropion in depression. II. The role of metabolites in clinical outcome. Arch Gen Psychiatry 45:145–149. (1989) Pharmacokinetics of diltiazem and its metabolites after single and multiple dosing in healthy volunteers. Ther Drug Monit 11:558–566. (2001) Fluoxetine pharmacokinetics and effect on CYP2C19 in young and elderly volunteers. J Clin Psychopharmacol 21:161–166. (2014) Itraconazole and clarithromycin as ketoconazole alternatives for clinical CYP3A inhibition studies. Clin Pharmacol Ther 95:473–476. (2005) Inhibition of CYP2D6 activity by bupropion. J Clin Psychopharmacol 25:226–229. (2013) Which metabolites circulate? Drug Metab Dispos 41:933–951. (2012) Prediction of relative in vivo metabolite exposure from in vitro data using two model drugs: dextromethorphan and omeprazole. Drug Metab Dispos 40:159–168. (2002) Desacetyl-diltiazem displays severalfold higher affinity to CYP2D6 compared with CYP3A4. Drug Metab Dispos 30:1–3. (2016) Mechanistic modeling to predict midazolam metabolite exposure from in vitro data. Drug Metab Dispos 44:781–791. (2013) Pharmacologically active drug metabolites: impact on drug discovery and pharmacotherapy. Pharmacol Rev 65:578–640. (2008) An in vitro mechanistic study to elucidate the desipramine/bupropion clinical drug-drug interaction. Drug Metab Dispos 36:1198–1201. , editor (2008) Drug-Drug Interactions, 2nd ed, Informa Healthcare, New York. (2014) Fluoxetine- and norfluoxetine-mediated complex drug-drug interactions: in vitro to in vivo correlation of effects on CYP2D6, CYP2C19, and CYP3A4. Clin Pharmacol Ther 95:653–662. (2013) Metabolism of a serotonin-4 receptor partial agonist 4-4-[4-tetrahydrofuran-3-yloxy)-benzo[d]isoxazol-3-yloxymethyl]-piperidin-1-ylmethyl-tetrahydropyran-4-ol (TBPT): identification of an unusual pharmacologically active cyclized oxazolidine metabolite in human. J Pharm Sci 102:3277–3293. (2004) Gemfibrozil and its glucuronide inhibit the organic anion transporting polypeptide 2 (OATP2/OATP1B1:SLC21A6)-mediated hepatic uptake and CYP2C8-mediated metabolism of cerivastatin: analysis of the mechanism of the clinically relevant drug-drug interaction between cerivastatin and gemfibrozil. J Pharmacol Exp Ther 311:228–236. (1993) Pharmacokinetics of citalopram in relation to the sparteine and the mephenytoin oxidation polymorphisms. Ther Drug Monit 15:11–17. (1985) Pharmacokinetics of amiodarone, desethylamiodarone and other iodine-containing amiodarone metabolites. Eur J Clin Pharmacol 29:417–423. (1989) Effect of diltiazem on the pharmacokinetics of propranolol, metoprolol and atenolol. Eur J Clin Pharmacol 36:67–70. (2008) The effect of gemfibrozil on repaglinide pharmacokinetics persists for at least 12 h after the dose: evidence for mechanism-based inhibition of CYP2C8 in vivo. Clin Pharmacol Ther 84:403–411. (2015) Dealing with the complex drug-drug interactions: towards mechanistic models. Biopharm Drug Dispos 36:71–92. (2007) Dynamically simulating the interaction of midazolam and the CYP3A4 inhibitor itraconazole using individual coupled whole-body physiologically-based pharmacokinetic (WB-PBPK) models. Theor Biol Med Model 4:13. (2015) Predicting the effect of cytochrome P450 inhibitors on substrate drugs: analysis of physiologically based pharmacokinetic modeling submissions to the US Food and Drug Administration. Clin Pharmacokinet 54:117–127. (2011) Are circulating metabolites important in drug-drug interactions? : Quantitative analysis of risk prediction and inhibitory potency. Clin Pharmacol Ther 89:105–113. (2013) A perspective on the contribution of metabolites to drug-drug interaction potential: the need to consider both circulating levels and inhibition potency. Drug Metab Dispos 41:536–540.